Welcome to the Bench Press, in which we ask one of our favorite luthiers a simple question: What the heck are you working on right this minute? Our first Bench Press installment is with Canadian electric and acoustic builder Joe Yanuziello. Visit Joe at www.yanuziello.com. 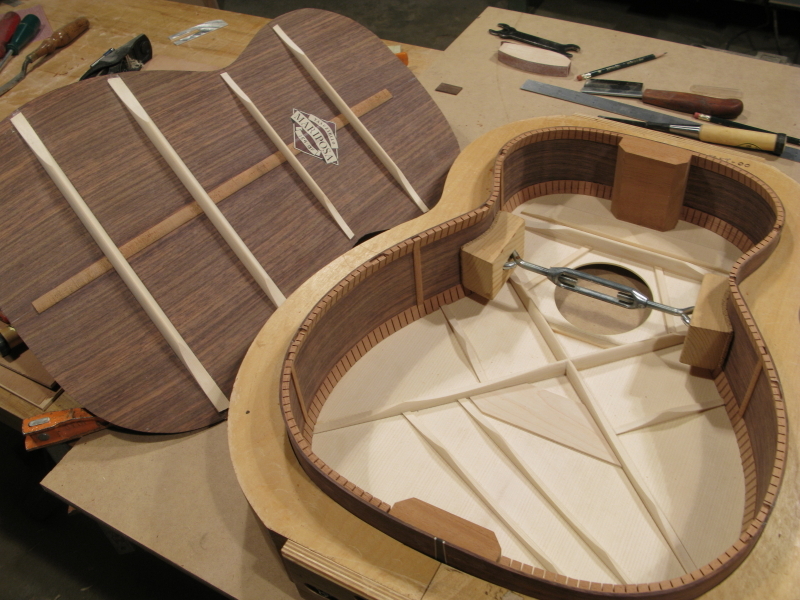 Fretboard Journal: What’s on the bench right now? Joe Yanuziello: At the moment, I have two guitars on the go. I’ve got a 00 Martin-style. 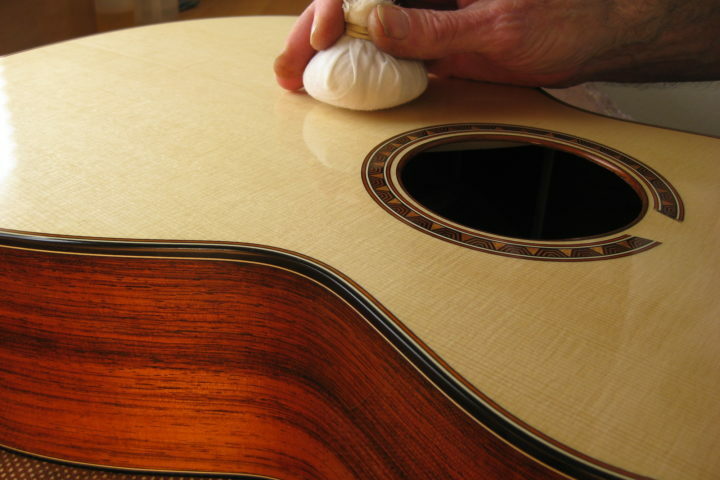 It’s slightly modified – a little rounder in the shoulders – but it’s basically a 00 sized Martin style instrument. It’s for Suzie Vinnick, a singer-songwriter in Toronto, who’s fantastic. I’m about halfway through that one – I’m just working on the neck. I’ve got the body built – it’s all boxed. It’s Indian rosewood and it has an Adirondack top. How can I describe it? It’s got kind of a cowboy-stitch purfling much like I would use on my dobros. The customer wanted that – she liked that detail. And my headstock logo is usually a transfer, like a waterslide decal you put on your model airplane wings. I’ve been doing these for years, much like National used to use and other companies too. It’s kind of a time period thing and I like that about it. But this customer wanted my logo done in pearl so my friend Mark Kett, I don’t know if you know about Mark, he’s a fantastic inlay artist. He’s just one of those guys, he’s amazing. So, he does inlay for me and it’s very intricate. God, there must be 60 or 70 pieces in this little one inch square diamond shape that goes in the headstock. 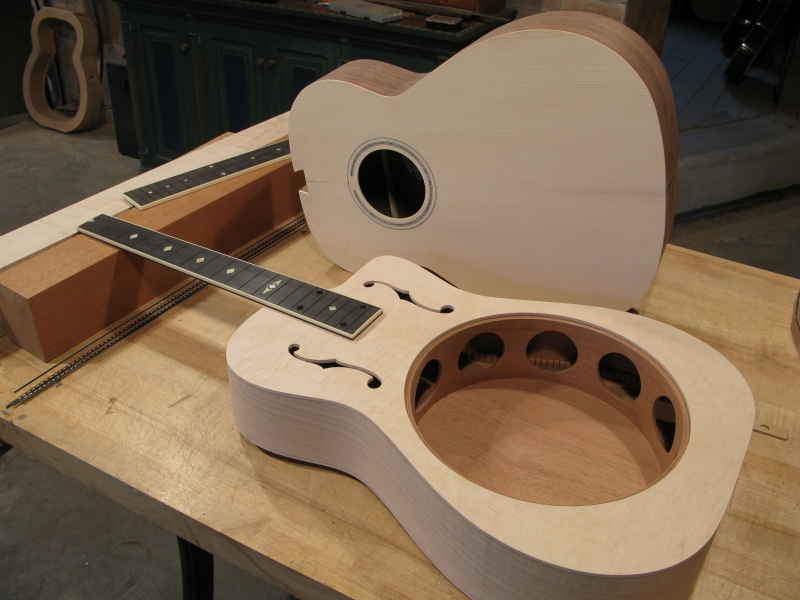 I’m going to inlay it as soon as the necks ready to go. What else have I got on the go? 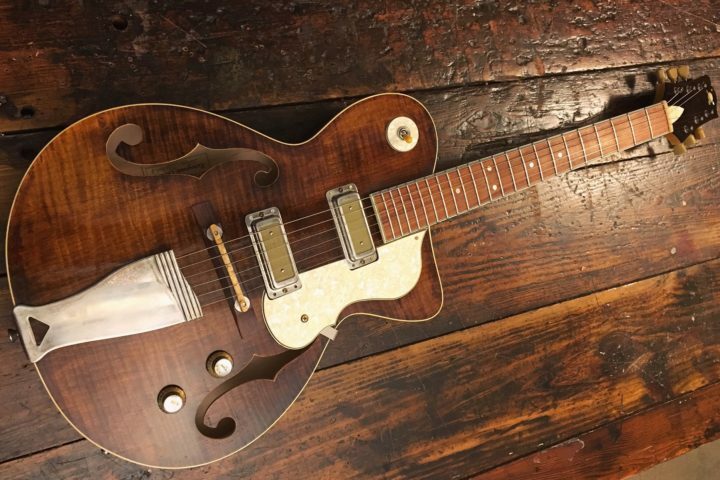 A resonator guitar, a roundneck-reso cutaway, for my pal Lindy Fralin who makes all my pickups for me. He’s getting this round-neck. And I’m about halfway through that one, too. FJ: Is this a special trade? JY: Yeah, it’s for pickups. He’s been making pickups for me since I think about 1996 or ’97. They’re much like gold foil DeArmond’s. He was making them for a while and selling them, but he stopped producing them. He makes pretty much everything else, as you know, he’s one of those boutique pickup guys but he still makes these for me, which is great because I make all my own covers for them out of brass. I solder up these brass covers, polish them and get them chrome plated. I’m happy to do a trade for him. FJ: Can you tell me a about the construction on that? JY: I’ve been making resonator guitars since 1992, a lot of square-necks and lately it’s been mostly round-necks. I think the market is pretty much saturated. They’re a lot of good instruments for lower prices so the higher end stuff like I’m making is not as salable, but I still get to make them every once in awhile. This one, all of mine basically, are made from select veneers, so I cold mold, kind of like making a boat. I have forms that I bend/mold the sides over and I compress them and then clamp them up overnight. Basically the sides the top and the back are laminated veneers – much like old Dobros were. They have sound wells, too. My sound wells are really aerated, though. The holes are huge in them so they’re kind of the skeleton frame, which weighs nothing. They take up very little air space in there. I’m still using that concept like the Dobros first started. I always like the sound of old Dobros. They’re kind of sweet and woody sounding, they’re not loud and aggressive sounding like some of the higher-tech dobros are these days. They’re fine, but I’ve been making these forever and I continue to because there are people that want these still. It’s great for me. I use Beard parts. I remember, when we started making Dobros, Tut Taylor used to sell parts out of his house – the cones and the spiders and all that stuff. They were Quarterman cones and cover plates; he had them manufactured or he was involved with someone who did. Now, after I think about three or four companies, they’ve ended up at Beard and I buy them from Beard’s Resophonic Outfitters. FJ: What’s the finish on the 00? JY: It’s nitro. It’ll have a dark brownish sunburst on it, I think. It’s not carved in stone. 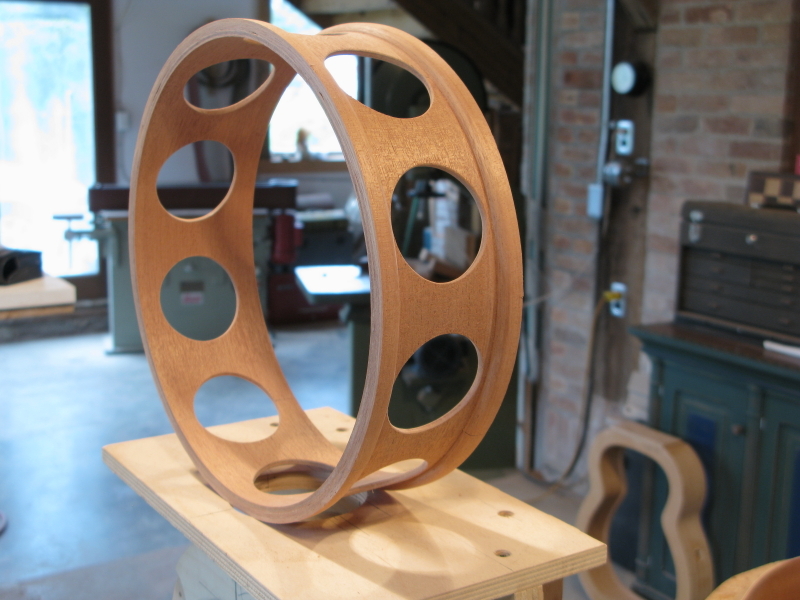 And the reso for Lindy will be a dark walnut sunburst in curly maple, as well. I love doing sunbursts – it’s one of my favorite things. 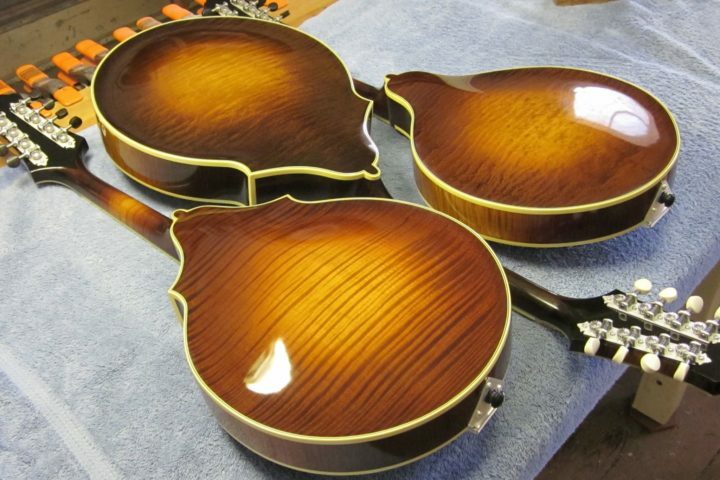 Maybe a half of all my instruments I’ve ever made have a total sunburst on the whole body or the top.